The results indicate that the adjunctive use of MCM + SRP is a clinically effective treatment option for the long-term management of adult periodontitis. Ref. : AMERICAN ASSOCIATION PERIODONTOLOGY – ANNUAL MEETING, 2002. Publication ref. : Journal of Periodontology, USA, Vol. 73: (10) p. 1243-44, 2002. This product is dispensed and applied only through registered dental practitioners. 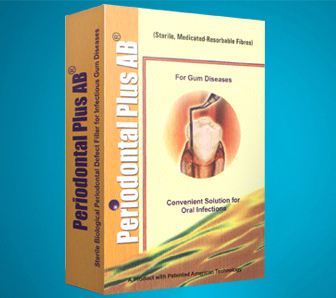 Periodontal Plus AB is available by medical prescription only. Periodontal Plus AB has to be stored under normal room conditions of humidity and temperatures between 4° to 49°C or 39° to 104°F. Periodontal Plus AB would have a minimum of 3 years shelf-life.